I’m in Cambridge at the moment, working at a summer job – oh, the delight. But I got today off and so went and did another section of Te Araroa – the Hamilton City Traverse. To be difficult, I did it all topsy-turvy. I started at the Taitua arboretum – a gorgeous wee place that I’d not seen or heard of before, and what a nice surprise it was. I’d definitely go there again. The place was full of birds, especially chickens. The arboretum is built around farm land, and there are two paddocks in the middle of it, so the arboretum and the farm are merged. Anyway, at several strategic points around the paths (and I spent an hour circling the place, because it was early and I had heaps of time and it was just too pretty to miss) there are chicken coops. The fat friendly chooks obviously expect human=food, and so I ended up trailing chickens, looking like a demented Pied Piper. Alas, the chooks were disappointed. 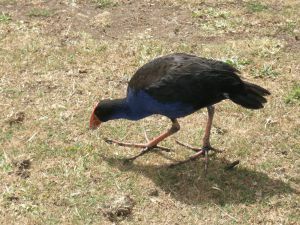 There were also lots of pukeko: a native bird about the size of a chook, with truly enormous feet. After leaving the arboretum I made my way to Till’s lookout, and then into Hamilton city centre. Here I stopped to have lunch and go to the movies. I saw The Lovely Bones, and lovely it was too. Then I took the bus out to Pukete – the other end of the HCT, and walked back to meet myself in the middle (city centre) of the walk again. The track from Pukete was all along the Waikato river; it was very well done, although my feet were getting tired of pounding pavement by the time I’d finished. Still, I took the time to end the day on a short detour, to see the Riff Raff statue. 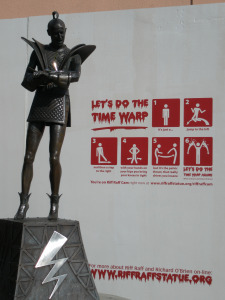 Richard O’Brien, creator of and actor in The Rocky Horror Picture Show, spent (or misspent) his youth watching B horror films in Hamilton, and I love that they’ve commemorated this with a statue of an alien transvestite (along with instructions for doing the Time Warp).